A couple of months ago, I spent far too much money at my local bookstore and I’m finally starting to make a dent in the ginormous pile that’s currently serving as my bedside table. Haha! 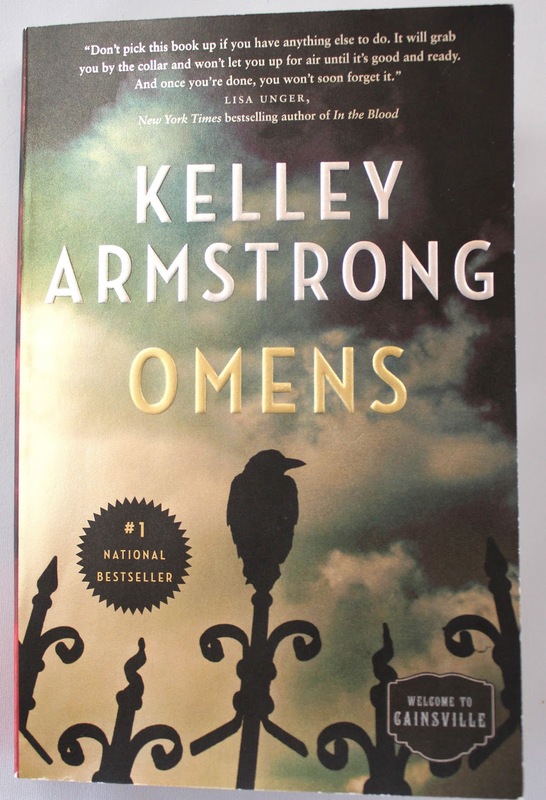 One of those treasures was OMENS, by Kelley Armstrong, and it came highly recommended by staff member Stephanie, who always makes the best suggestions. I’ve never read a Kelley Armstrong book before which, judging from the inside of the front cover, is quite a feat considering she’s written about ten thousand of them. Okay, okay, she’s only written fifty-three (plus a number of other pieces, including short fiction). Slacker. Ha! Anyway, OMENS is the start of a paranormal suspense series, and has one of the most likable main characters I’ve read in a while. I mean, not only does she have an incredibly wry sense of humour (*giggles*) but she can interpret omens. Or, she'll eventually learn to interpret omens. For the time being, she's stuck wondering why she remembers sing-song phrases from a childhood she'd once considered to be a dream. That is, until a news report broke, shattering her crystal and diamond world. Poor Olivia-slash-Eden. One moment, she’s a philanthropist-in-training, living in a mansion and taking champagne Jacuzzi baths, and the next second, she’s all over the press as the long-lost daughter of two serial killers. Sounds crazy, right? Well, only the part about champagne Jacuzzi baths; Olivia isn’t even almost the kind of gal who’d be so wasteful and pretentious (one of the many reasons I love her). And that kind of realistic, get-on-with-it mentality serves her well when she decides to leave the Lifestyles of the Rich and Famous in order to find out the truth about her parents taking up residence in Cainsville, a tiny town in the middle of nowhere, where her biological parents used to live. 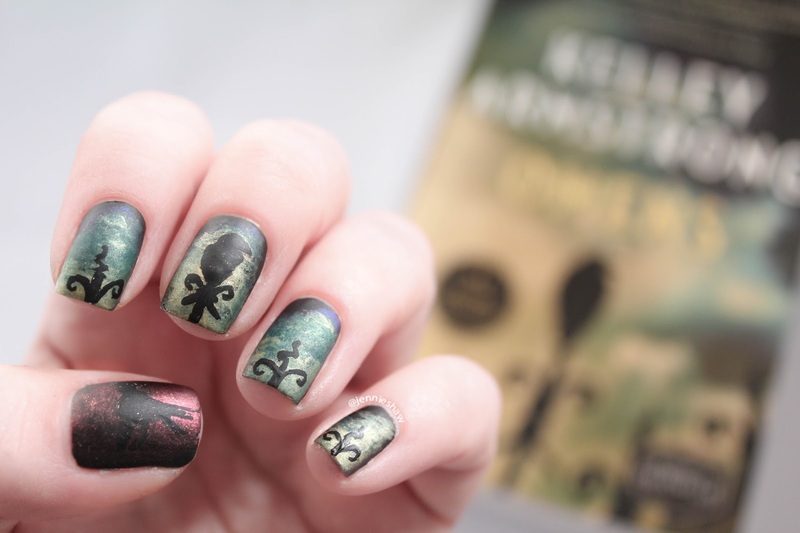 I had a fun time painting this cover mani but couldn't figure out what to do with my thumb, so when I noticed the spine of the book had a different picture, I tried to add the other raven. As you can see (or not as the case is here, haha), it didn't really work out. I have a limited selection of red polish, and this one is clearly far too dark because the black bird doesn't have enough contrast. 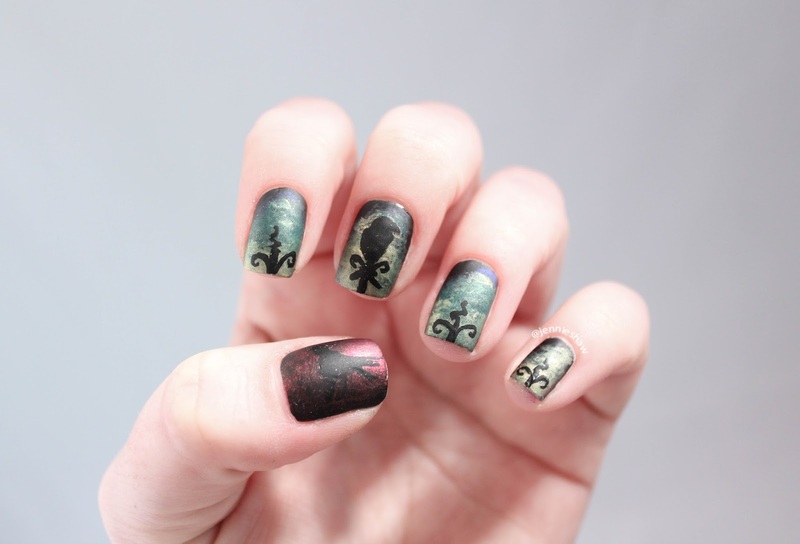 #nailfail. Oh well. Can't win 'em all. Haha! Now, it may seem obvious that the town of Cainsville is a character in its own right (as the series is literally called the Cainsville series), but I didn’t anticipate how much of the book would be about the small, rural community. And that’s really what hooked me. Because yes, there are at least seven different sub-plots that piqued my curiosity, along with delightfully strange characters of all sorts, but I suspect that all paths lead back to Cainsville, where there appears to be a metaphorical onion of paranormal mystery--layers upon layers of intrigue--all they way down to the mysterious gargoyles. What's the deal with those little guys? I need to know! Haha! 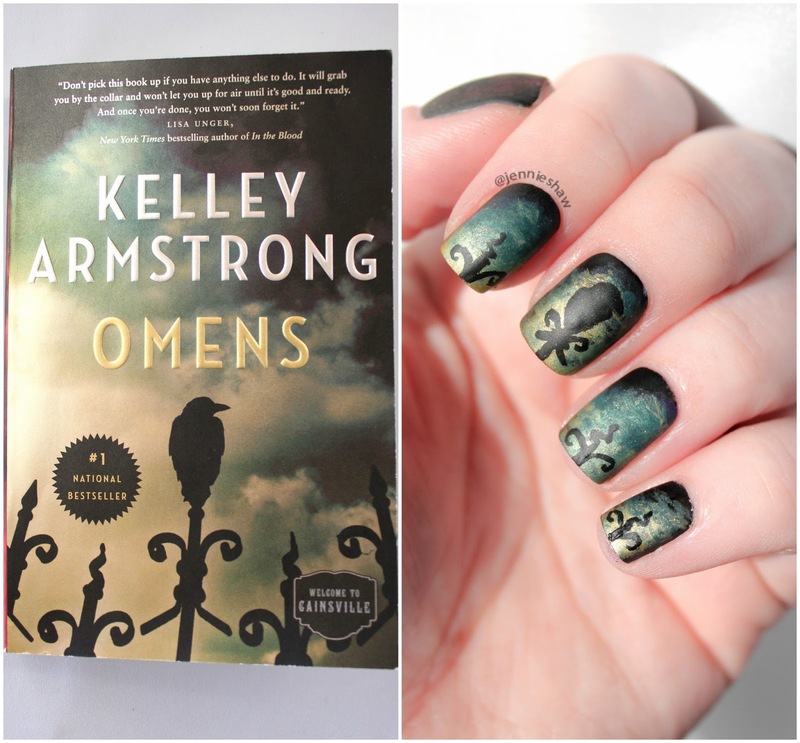 So in that sense, OMENS has airs of The Witches of Eastwick, and I'm pretty much obsessed with finding out more about Olivia. Now, I will say that things took a bizarre-o turn at one point, and it almost turned me off, but I was sucked in by that point and had to keep going. That’s pretty much all I want to reveal for now, mostly because all I have is speculation as to what’s really going on in Cainsville and at the end of the day, isn’t that what the first book of a series is supposed to do? Poke and prod at your curiosity? Of course it is. Because if the first in a series isn’t intriguing then it hasn't been done right. So rest assured, guys and gals, OMENS is certainly an engaging read and I feel confident that the rest of this series will be bananapants. I'll definitely be picking up the second (which has been out for a bit so I don't have to wait, woot!) and if you're into paranormal mystery/suspense, I recommend that you do, too!